Coming off two straight victories, Bahrain MMA superstar Hamza Kooheji doesn’t have a bout lined up for his Brave Combat Federation return. 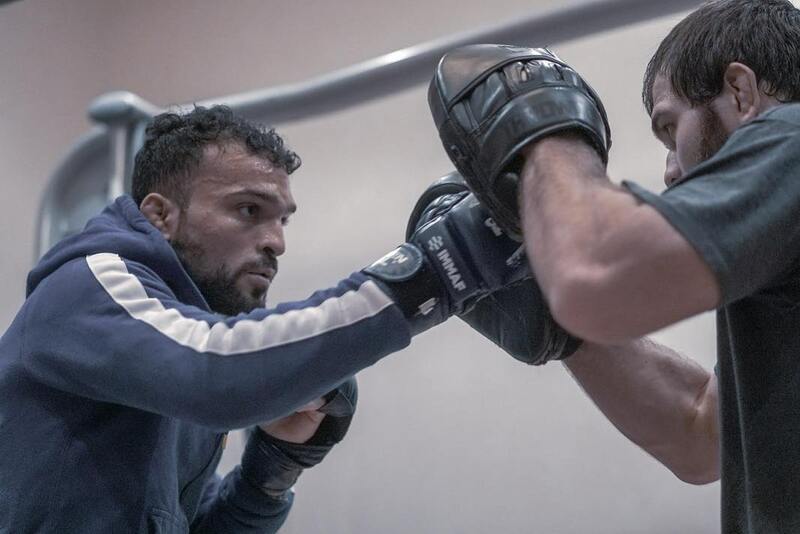 He’s focused on helping Eldar Eldarov, who fights for the inaugural Super Lightweight title at Brave 23: Pride and Honor, on April 19th, against Mounir Lazzez. And he’s excited about his head coach’s chances in Brave CF’s upcoming return to Jordan. Hamza was complimentary of Mounir Lazzez’s fighting style but guaranteed that “The Sniper” would be no match for Eldarov’s relentless wrestling and pressure. Kooheji is confident that Eldar will become the first-ever Bahraini MMA world champion. “Mounir is probably one of the best fighters from the Arab region. He’s tough and durable. He showed in his last fight that he can take a punch. Lazzez had good stand-up skills, and Eldar is a great grappler. I think Eldar’s grappling is on another level. It’s going to be a tough fight for both, but I feel like Eldarov’s grappling will be the difference and he will become the world champion”, said Kooheji. Eldar and Hamza are more than coach and student, as the Featherweight contender describes his wrestling mentor as a family member. They have been friends for more than four years, and Kooheji feels that Eldarov has helped change the landscape of MMA in Bahrain and deserves the success coming his way. “When His Highness Sheikh Khalid was beginning to form the KHK MMA team, we thought of Eldar as our wrestling coach. We were very excited to have him because our level in wrestling wasn’t very good. Since he came here, he changed that. My opponents think I’ve been a wrestler all my life, but I’ve only begun working on that with Eldar. We’ve been through a lot, and I feel like he’s family to me. He has helped change MMA in Bahrain for the better, no one can dispute that. And now he’s going to make history for our country”. Brave 23: Pride and Honor marks the return of Brave CF to Jordan. The biggest fight card in MMA history will feature three title fights, with Jordanian icons Jarrah Al-Selawe and Abdul-Kareem Al-Selwady defending their world titles against Abdoul Abdouraguimov and Luan Santiago, respectively. Aside from that, the historical Super Lightweight inaugural world championship will be on the line, with Bahrain’s Eldar Eldarov facing off against Mounir Lazzez, from Tunisia.